I took this beautiful picture during the groom preparation for his big day at Toronto Botanical Garden. This wedding day was completely atypical. Instead of taking the traditional portraits of the groom getting ready for his wedding, the couple wanted only candid shots of the groom and the groomsmen. 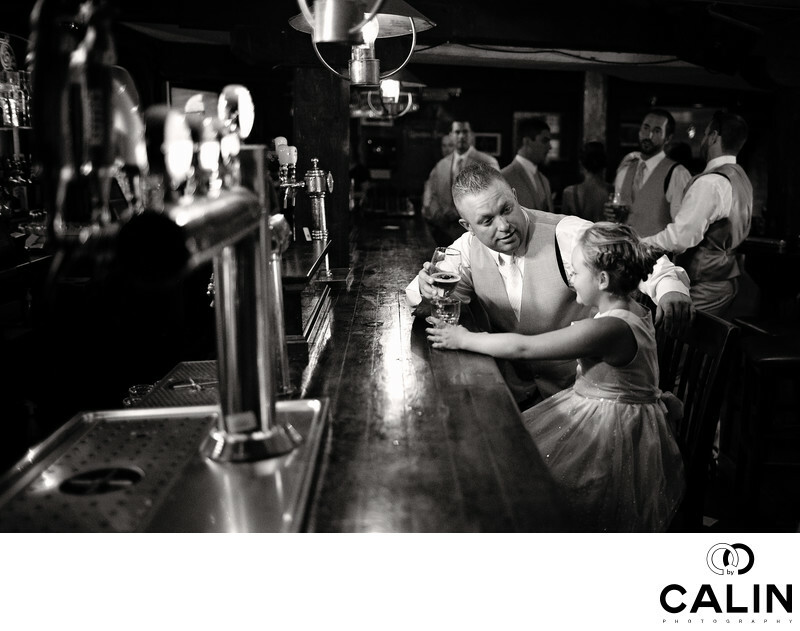 This image portrays the groom having a chat with the flower girl at the bar in the Floral Hall. In the background we can see the groomsmen enjoying a pint of beer and talking energetically. The main subjects in this wedding photo are the groom and the flower girl. I placed them on the right side of the frame and positioned myself so that the left side shows a beer dispenser that creates an element of interest, and balances the image. The image includes three layers. The beer tap in the foreground gives the image depth and creates a leading line towards the subjects of the picture. The groom and the little girl occupy the middle ground of this image. Finally, the groomsmen complete the background layer of the picture. To make the main subjects of this image stand out, I illuminated them using a continuous light cast from the left of the camera by my assistant. In post processing I applied grain to the image to give it a film look. Also, I converted the photograph in black and white for more vintage feel. Finally, I burned the edges of the frame and dodged the subjects to create an even greater contrast between them and the rest of the picture. Location: 777 Lawrence Ave E, North York, ON M3C 1P2, Canada.